Air Engineering Support for the ship's embarked air group was provided by around sixty personnel of all Fleet Air Arm Engineering specialisations. To support a variety of complex aircraft, extensive purpose-designed workshops were housed in compartments conveniently located close to the aircraft hangar. Personnel of the electrical and radio specialisations were able to service, test and repair a wide range of electrical equipment using up-to-date analogue and digital techniques. The staff in the mechanical workshops were able to repair many aircraft engine and airframe components, as well as carry out detailed examinations of aircraft parts using non-destructive test techniques. 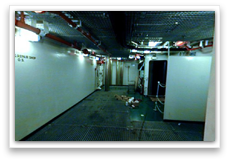 This section also provided the nucleus of the ship's salvage team and looked after the maintenance of aircraft ground equipment and motor vehicles. 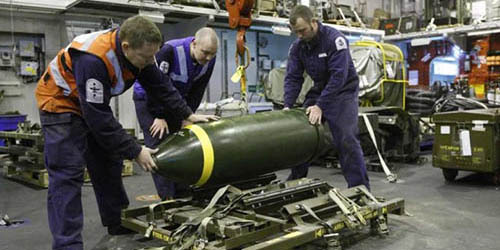 Weapons maintenance and supply teams were responsible for the safety, supply and maintenance of a wide range of aircraft weapons and their associated carriage equipment, spending much of their time in the magazines in the depths of the ship. The Survival Section maintained aircrew and aircraft survival equipment and was also responsible for carrying out pre-flight briefings and aircrew survival training.